Headwind GSM Modem Driver is a professional SMS messaging software which connects the PC with a mobile phone or a GSM modem in order to send and receive SMS messages. The unique feature of the software is the automatic configuration of the serial connection in accordance with the device capabilities, which makes Headwind GSM Modem Driver potentially compatible with every ETSI-compliant GSM or CDMA device. 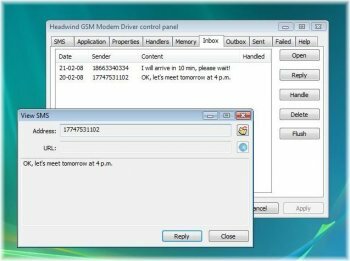 Once configured, Headwind GSM Modem Driver can be automatically launched at startup and is always available in the system tray. can't you like do that already with AIM (or trillian) for free! Since I may not nderstand some I'll give it a 3 to be neutral.